An ENQUIRER reporter and a photographer were with Majors at NASA's John F. Kennedy Space Center at Cape Canaveral, Fla., where he filmed a special two-part episode called "Enemy in Space," to be aired Sept. 25 and Oct. 2. (NB. This episode aired under the title "Deadly Countdown" - JP). 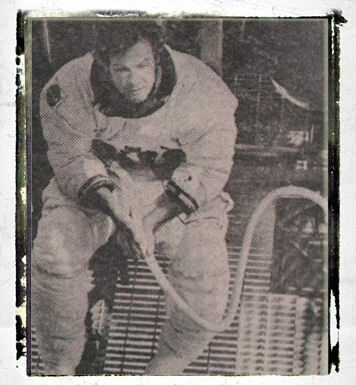 Majors' grueling role called for him to wear the same type of space suit NASA astronauts wore on their moon mission. Normally astronauts wear a special cooling suit under the 48 pound, 23 layer, $66,000 space suit, but the suit's system malfunctioned, leaving Majors to literally sweat his way through scene after strenuous scene. "It's like having your own personal mobile sauna," complained the 36-year-old actor, who each day of filming lost five to six pounds of body weight in water alone. "When you start moving, you can actually feel the sweat running down inside the suit." 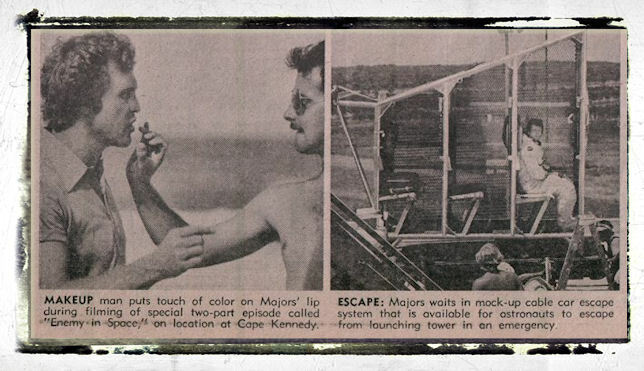 Under the blistering Florida summer sun, encumbered by the heavy airtight space suit, Majors inched his way along space shot gantries hung hundreds of feet high, jumped in and out of a helicopter, and slid 160 feet down a steep escape chute. "The space suit was really built for sitting or lying down," majors later complained. "I felt like Humpty-Dumpty trying to run." The lean actor, suffering from the intense heat and hard work, constantly fought off dizziness. At one point, a nurse who travels with the crew injected him with a dose of vitamin B12 to revive him. "The B12 gives me a certain extra amount of energy," Majors explained. Director Cliff Bole told The ENQUIRER: "Sometimes I simply don't know how Lee keeps the pace up. I've directed Robert Blake on 'Baretta' and the two guys on 'Starsky and Hutch' and they are tough and through a lot of physical shooting. But 'The Six Million Dollar Man' has to be the most grueling show on TV for any start to put together." Majors' work on 'The Six Million Dollar Man' sometimes stretches to 13 hours a day and the actor - who just signed a $3 million, two-year contract - has a reputation for being moody and irritable at times. "Yes, I do get irritable," he conceded. "But people tend to get the wrong impression because of the way I work. If I do a shot with a lot of dialogue I try to go off somewhere at the side of the set and keep my lines in my head. If I talk to somebody, I break that concentration and when I come back I start blowing the shots." Then he admitted: "O.K., I am moody. But that's just part of my personality. I suppose Taurus people are moody and that's that." Ever conscious of his weight, majors has a unique way of eating the two fillet mignons he consumes for lunch. "I chew the meat and the juices out and then spit it out," he said. "People ought to try it. You satisfy your taste buds and it feels like you've eaten. "Anyway I have a pretty wife at home who cooks great." Majors said, referring to lovely Farrah Fawcett-Majors. "So I usually wait until I get home at night for a big meal." 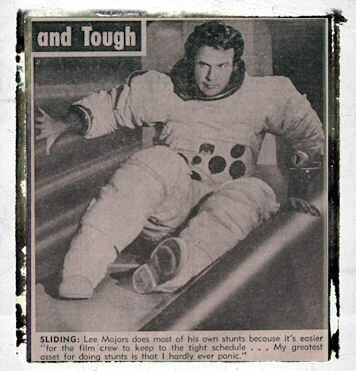 Majors actually does about half his own "bionic" stunts, including many of the air and underwater scenes, and he explained why: "The more stunts I do myself, the easier it is for the film crew to keep to the tight schedule." But Majors draws the line on stunts that he's not confident about. "I broke my nose once while filming 'The Big Valley'," he recalled. "So far I haven't really been hurt in 'The Six Million Dollar Man.' The only problems I've ever had have been twisted knees from jumping. "My greatest asset for doing stunts is that I hardly ever panic at anything. I guess I've lived in the land of make-believe so long that I figure it's just automatic that everything's going to come out all right."